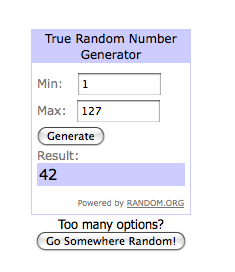 One Lucky Day: And The Winner Is..? I am overwhelmed by the response. Going into this giveaway, I had hoped for 50 comments. You passed that in 7 hours. There were 127 of you that got your comment in on time. What a great giveaway! I've enjoyed the tag tutorials. If you MUST de-stash, I'd be thrilled to win. Happy New Year! Please contact us with your full name and address. Congrats Deanna! You are one lucky dog! LOL!! Enjoy!! I am envious!! Congratulations Deanna! I don't know you, but I am jealous! Anything from Paula and Deb is to die for! Oh my my! I'm so excited. I can't believe it! Thank you thank you thank you! Oh snap! I was sure I was going to win. But Deanna, congrats to you. Have FUN!!! Congratulations Deanna! And thank you Paula & Deb for such a great give-a-way!